UK, 1970, 97 minutes, Colour. Warren Mitchell, Pat Heywood, Elaine Taylor, Vanessa Howard, Adrienne Posta, Richard Briers, Kenneth Cranham, Terence Alexander. Directed by James Mc Taggart. All The Way Up is based on a play, Semi- Detached, by David Turner. 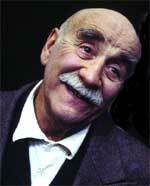 It gives Warren Mitchell a change of pace from his famous Alf Garnett attitudes and language. Despite some unnecessary 'Carry On' vulgarity, the film is a rather hard hitting comedy about snobbery in the suburbs and a family on the make at everyone else's expense and whose only scruple is what the neighbours will think. Serious films like The Reckoning, I'll Never Forget What's 'is Name, have shown up the English business world and its politics, but this comedy shows us the neighbours (of course, it is actually showing us a parody of ourselves but nobody will want to admit that). The duplicity and ambition of Fred Midway are loathsome, but he comes out on top despite some close shaves. A black comedy on a very popular level which ought to trouble somebody's conscience. 1. Fred Midway, what is the significance of the surname? His schemes for promotion, lies and rumours about executives, his ambitious house, money, place in society, manners, material success for his children, showing them an example of 'self help'. Yet he is ridiculed by the author? his change of accents, his mispronunciations; give other examples. His crises; and yet his mind is ever ready to manoeuvre and think up some dirt against someone. 2. Hilda Midway, what kind of wife? Snob? Weak? Carried along by her husband? What are the most despicable things she does? 3. Tom and his manoeuvres to marry Daphne to the boss, taking Nigel to the striptease for grounds for divorce, blackmailing his father at the end; he looks so unprepossessing (hair, bike), and yet is second only to his father. 4. Avril and Nigel? Avril using the marriage for forcing the uncle's will; her readiness for a divorce. Is she real or too much of a caricature? 5. Eileen, the most normal, and yet she fits into the pattern of the family ambitions? Her only offence to her parents is that she gave occasion for a scandal? 6. Daphne and Mr. Makepeace, manipulation, old fools, knighthood, possibility of being blackmailed. 7. What sense of right and wrong did the Midways have? Fred had standards? What were they and what were they based on? What was the nature of the hypocrisy? 8. The film has 90 minutes of packed ambition and hypocrisy. While it was compressed and exaggerated, how typical is this kind of attitude in your experience? 9. Did the film have a message? For whom? Do you think the message would get through to suburban hypocrites and go-getters?